First off, I want to clarify that my baby currently does not have his own room. So I'm not going to pretend I have some huge house and ample space to do everything I wanted for his nursery. However, with just a portion of my own room, I still feel like I gave him everything he needed and more. And by he needed, I mean that I needed in order to feel like I poured my heart into it. 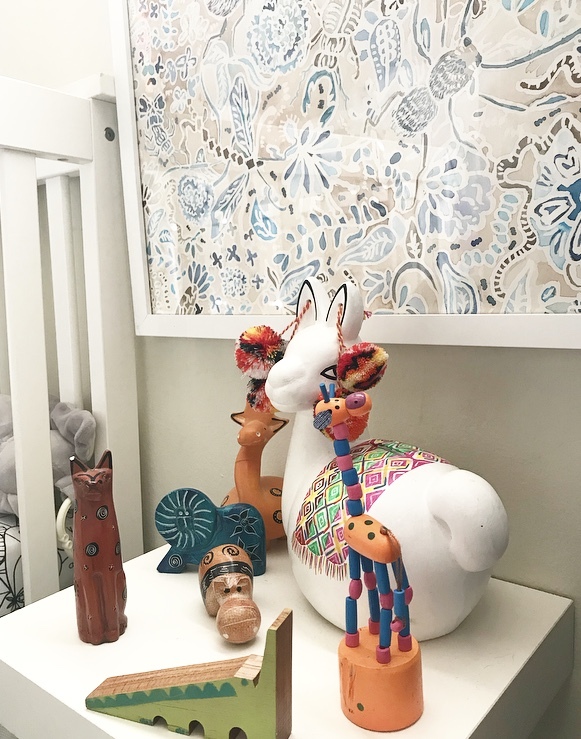 The whole nursery started off with my discover of one of my favorite illustrators, Charlie Harper and his product line through Land of Nod. I was obsessed with his black and white sheet designs and decided from there I would start with Black and White and then add really bright color. And my color challenge was incorporating pink because I liked the idea of baby boys being exposed to pink too. Again, not a lot of space to work with so it was all in the details. I painted some creatures on the wall for my little man because what kind of mom would I be if I didn't?! But I tried to imitate Charlie Harper's illustrative style as much as possible. Then I featured a little bed side floating shelf from Ikea with little animals Michael and I picked up from different places. One of which was the trip we took to the San Diego Zoo when I was pregnant. (The trip Michael proposed to me) These little figurines were from all over the world and we liked bringing in that ethnic exposure to the baby's room. Which reminds me! The sole reason I wanted to bring color was because my rad sister brought me a handmade mobile from Madagascar. Like HANDMADE! And it was pink with a little yellow. So of course I had to incorporate that. The rest was just little details. A gifted Jonathan Adler giraffe ceramic nightlight. A striped rug from Target that I really do wish was more crisp white but will probably replace it at some point. And Michael's beautiful handmade sign straight out of a Pinterest board. I mean, could he be any more of a cuter Daddy?! Yeah, no. I hope you guys like it and as you know, no room is ever really "done". It will change as we get a bigger space and as little man gets bigger and bigger.